Select 3 bottles of your choice from the amazing Salt Nicotine range. It is always a good deal to buy in bulk as you get to try more flavors for a lower price. The Bulk Discount E-liquid Pack allows you to pick 5x30ml bottles. If you are looking for the new hype in vaping then you are in the right place. The new salt nicotine provides a higher dose of nicotine (up to 50mg) in a single e-liquid with a lot less harshness when inhaled. It can be successfully used in pretty much any kind of device, yet users prefer to use it with Pod Systems. The price is fantastic, however the watermelon flavor tastes exactly like 4 loko watermelon vomit. I recently took advantage of a Holiday sale Apollo had and ordered Havana Nights Maui Waui and Refresh and think that are all great,i will be trying some of the other Salt Nic flavors that Apollo offers in the near future. Good variety in flavours and enjoying the spinner. I think if customers could get 4 or 5 of these for $45 then the price would be right for me. Some of us are low income. But I guess that is why I wait for coupons to be released. The juices are good so it is worth the price just wish we could get more. One of the best deals I have ever seen for Salt nic flavors. The stores out here are charging an arm and leg for just one bottle. 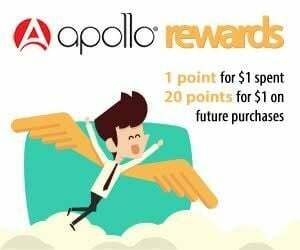 Apollo always has great deals and fast shipping which is why I always come back. I always recommend when people want to try multiple flavors is to do the bulk packs because they are much cheaper. I always add in a discount code that the cs team gives me and it makes shopping here worth my while. Only complaint is that the salt nics are a little more pricey. I've heard because of the nicotine used it is more expensive but that is okay with me because the quality is there and that is more important to me. I really hope that some day the salt nics go on the deal of the week so I can try more flavors. Affordable way to try three new flavors. Ordered this and the Spinner O Kit and waiting to get my order. Checkout process went smooth and customer service was very helpful in answering my questions. Recommend reading the blog posts they write. Great experience all around.